Right now MARS WRIGLEY Confectionery Pre-filled Easter Eggs for $9.98. •This 155-piece bulk candy pack includes Skittles and Starburst Original Candies, Life Savers Big Ring Gummies, and Hubba Bubba Max Bubble Gum. 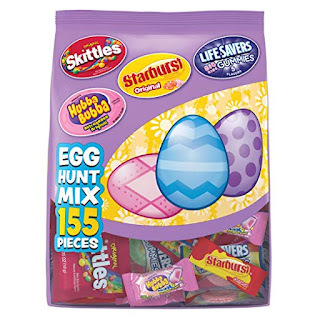 •Skittles bite-size chewy candies, Starburst Fruit Chews, Life Savers Gummies, and Hubba Bubba Bubble Gum make for the perfect spring treat. •Perfect for Easter baskets, Easter egg hunts, gifts, crafts, parties, or simply for sharing. •Four kinds of delicious candy in one bag for spring festivities.